Synopsis: A successful software developer, James has thrown himself into a new goal — to finally conquer the noise in his mind. And he has a plan. He’ll confront his darkest fears and build something beautiful…a garden. When he meets Tilly Silverberg, he knows she holds the key — even if she doesn’t think so. After her husband’s death, gardening became Tilly’s livelihood and her salvation. Her thriving North Carolina business and her young son, Isaac, are the excuses she needs to hide from the world. So when oddly attractive, incredibly tenacious James arrives on her doorstep, demanding she take him on as a client, her answer is a flat ‘no’. When a family emergency lures Tilly back to England, she’s secretly glad. With Isaac in tow, she retreats to her childhood village, which has always stayed obligingly the same. Until now. Her best friend is keeping secrets. Her mother is plotting. Her first love is unexpectedly, temptingly available. And then James appears on her doorstep. Review: It’s been three years since the death of Tilly’s husband and since then, survival and being a ‘supermum’ to her eight year old son Isaac has been her sole focus. Tilly runs a small garden nursery from home and is happy with how the business is managing with no views to expand or work more closely with her clients. James is a successful businessman who has retired at age 45 with plans to focus on improving his emotional and psychological health. Essentially he wants to overcome the OCD (obsessive-compulsive disorder) that controls his life. He is not deterred by the deterioration in his functioning since his father’s death because he has a very simple plan. A plan that involves Tilly and her nursery. James has an intense fear of dirt and he hopes Tilly can design a garden around his home to give him the ultimate exposure to his phobia. The moment James pulls up at Tilly’s home in a flashy car and flawless suit and sees her barefoot in the garden with dirt on her hands he feels a pull towards her. Tilly also feels a subtle connection with him but quickly senses his need for perfection and turns down the garden design job. James is nothing but persistent, because not only could Tilly offer him liberation from his fears of dirt but her honesty and non-judgemental attitude can also offer a foundation of trust and acceptance that he thought he could never achieve in a friendship, let alone a relationship. James quickly falls for Tilly and she warms to his quiet, dependable nature but isn’t quite ready to allow someone into her life who is as emotionally damaged as herself. So when she receives a call from her mother in England following a fall, she and Isaac hop on a plane and she revels in a return to her childhood home. Hoping her family home would provide her with some security and predictability, Tilly is thrown into an emotional whirlwind when her first love, Sebastian resides nearby and reignites past feelings. Tilly also discovers a medical problem that requires further investigation and forces her to reflect on her own mortality. Her situation is further complicated when James appears in England open to compromise- if Tilly won’t create a garden for him, then she will teach him how to do it himself. James and Tilly develop quite an emotionally intimate and intellectually stimulating friendship which stirs hidden fears and worries. For James it is the fear of not having Tilly, of losing her or disappointing her. For Tilly, it’s being open to love again when her last love resulted in widowhood. I really enjoyed the relationship that develops between James and Tilly; it’s believable and characterised by raw emotions and fears. 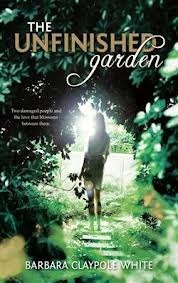 Usually I am quite fussy about how mentally ill characters are portrayed in books, but in The Unfinished Garden, I think the author did a fantastic job in creating a hero who has OCD but is also strong, masculine and attractive. The author’s personal experience of OCD in her son lends to a well-researched and credible profile of a character with OCD. Tilly’s grief and guilt is also well represented and together with James they make very real, very likeable and also flawed characters that lured me in. The only part of the story that I didn’t think was too necessary was the role of Sebastian, I felt like he was just an additional hurdle placed in the path of James and Tilly and in some ways undermined the grief she felt for her husband’s death. But I did like how this was resolved at the end. The Unfinished Garden is a sweet contemporary romance novel with well fleshed out characters, broaching serious subjects such as mental illness and grief. Next postWeddings, books, book-themed weddings and wedding books! Oh, I really like the sound of this one (although, sadly, I know from personal experience that not all software developers are likely to retire at a young age 😉 ). Thanks so much for pointing it out! Thanks for reading and reviewing TUG!